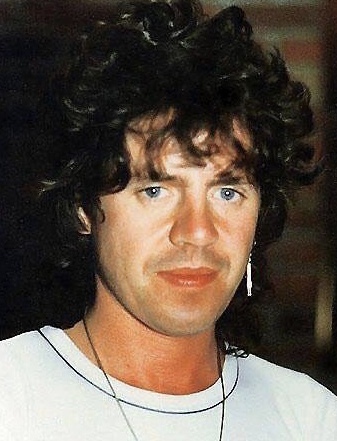 Mick died in hospital at 11.35am the 14th of February 2002. He had become unwell the Friday before and had informed friends he was going to see the doctor, but was then admitted to hospital on Saturday February 9th – a day we all remember, it being the anniversary of Brian’s death. Unfortunately Mick’s health went downhill and he passed away. With him were his family including his wife Janet, his daughter Ayston, niece Angela with her husband Martin. Andy Scott: “Mick Tucker was the best drummer around in the 70’s. I played in the same band as him and was proud to do so. I feel extreme sadness therefore that he has now left us and my heart goes out to Janet and Ayston with their sad loss.Miss you Mick – and then there were two”. Mick’s funeral took place at Chorleywood House Cemetery at 12.30pm on Monday Feb 25th. 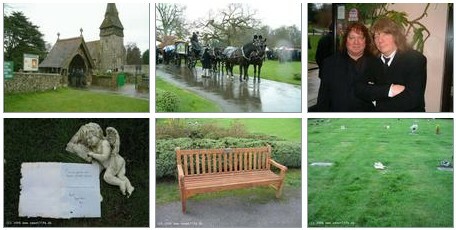 Mick is buried in an un-named grave in Chorleywood. The location is 51 degrees 39.644 minutes North, 0 degrees 30.330 minutes West (WGS84). It is marked by a sleeping angel. In 1965, Mick and vocalist Ian Gillan of Deep Purple formed a soul band Wainwright’s Gentlemen and embarked on a career in pop music, playing around pubs and clubs. Vocalist Brian Connolly replaced Gillan when he moved on to Deep Purple fame, while Wainwright’s Gentlemen kept playing a mixture of R&B, Motown, and early psychedelic sounds. The band split in 1968. He then became a founding member of the band “Sweetshop” in January 1968 along with Steve Priest, Brian Connolly, and Frank Torpey, who was later replaced by Mick Stewart who was himself succeeded by Andy Scott. The name “Sweetshop” was a reflection of a sugary trend in Rock and Roll with bandnames like Marmalade, Strawberry Jam, Clockwork Orange, Tangerine Peel etc. and was shortened to “The Sweet” in 1968 as a name that instigates all of the sweetness of flower power. Sweet extensively toured the US and had a strong following in America. On an objective view Mick Tucker was a very talented drummer with a range of complex rhythms who could have helped any band considerably. Steve Priest said of Tucker “He was the most underrated drummer that ever came out of England,”. ″He was the powerhouse of the band. He was technically marvelous. His timing was impeccable, and yet he had a lot of soul as well and he really felt what he was playing.” Tucker was able to improvise tirelessly and played a seemingly never-ending flow of creative solos. Tucker began and ended his drum solos with his rendition of Elmer Bernstein’s theme from the 1955 film The Man With the Golden Arm. Tucker also used two projection screens that was above his drum riser. One screen played a videos of him playing the drums, simultaneously the other video showed him playing timpani. He would trade off solos with these videos, then came out front and play the timbales along with a fast Christmas-style recording. Just before the band would come back, he would play the Bernstein melody on tubular bells and timpani. Tucker tried to make sure his solos appealed to all of the audience. Tucker understood that a great performance consisting of great played technique and presentation in equal doses. His style reminded of an early Keith Moon. Mick was one of the few double bass drummers that didn’t let the second bass drum get in the way of a swinging tune like ‘Ballroom Blitz.’ He had a great feel on double bass, played them effortlessly. Other drummers who where influenced by Tucker fans are J and Snowy Shaw (King Diamond, Dream Evil, Mercyful Fate, IllWill, Notre Dame and Memento Mori). Rest in peace Mick, you will always be in our hearts.